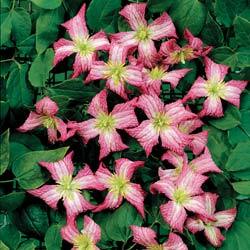 Minuet Clematis: Small flowers dance in the wind. Small two-colored flowers dance in the wind. Imagine the grace this adds to any garden! Flowers are darker than those of Little Nell. Picture it planted with a shrub with dark leaves!